Opinions vary from person to person, yet most times we develop these opinions by understanding the opinions of others. By imbibing what exists in society, and its attitude towards a prospective. So come, let us discuss today ideas and outlooks. What’s on your mind? Window treatments are not a luxury but definitely ‘essential’ for any home. You have a wide range of choices available these days and making the apt choice can be a wee bit confusing. There are many benefits offered by using blinds as window treatments and having some knowledge of these can work as a convincing factor. Blinds are definitely the ‘right’ choice for any home. 1. Wide Range available: With the different preferences of the homeowners, blinds works out an apt choice. This is due to the fact that these are available not only in different materials but also a wide range of sizes, colors and shapes. To ensure you are making the perfect choice you can consult a professional designer. This ensures the look of a home and also the functionality factor. 2. Control of Light: Now it is easy to make your room dark and cozy when you wish to take that nap or listen to your favorite music. All you need to do is close the blinds. When you feel the need of light, open these. It is easy. You also have a choice of opting for the blinds operated with the help of a remote. You do not need to even get up. Investing in blinds is opting for total control of the light entering your home. 3. Privacy catered to: Blinds are options which allow you total privacy. This factor of privacy is definitely a ‘luxury’ these days as most of the homes built are extremely close to each other and most of the times you have the neighbors peeping in to find out what is going on in the interiors of a home. 4. Choice of Materials: Opting for blinds is not a costly affair as you have different materials available in these with a wide price range. Besides catering to your preference and style these also cater to your budget. Some materials available are wood, faux wood, plastic. Metal and so forth. 5. Easy Maintenance: Most homeowners are looking for ‘easy maintenance’ with their homes. Blinds works out an ideal choice as these do not require much of maintenance and can be cleaned with ease. Most of the blinds only require a wipe with a damp cloth from time to time. This can keep them sparkling clean. As most of the blinds are long lasting there is no requirement of replacing these unless you feel you need a change. Types of Blinds available: As mentioned earlier, there is a wide range of options available when you opt for blinds. Listed below are few types which can work apt for any home. *Vertical Blinds: Vertical blinds are available with individual slats running along a track at the top of the chosen blind. You can choose those which open from the middle or from side to side. These work apt for windows which are from floor to ceiling or even for patio doors. *Mini Blinds: Similar to the Venetian blinds, the mini blinds have slats of a small width which are around 1” thick. *Venetian Blinds: Venetian blinds are a favored choice of most homeowners. These have slats which are horizontal which attach with strips of cloth or string termed as ‘tapes’. *Panel Blinds: Panel blinds work out an apt choice for patio doors and windows which are large. These have sections moving along a track. Considerations for Blinds: Now that you have decided to opt for blinds you need to ensure you follow some tips. This ensures you make the right choice and gain the multiple benefits blinds offer. 1. You need to look for a material which is suitable for that specific area of your home. Plan on roman blinds or aluminum blinds for areas exposed to high heat. Places like the kitchen and bathroom are termed as ‘wet zones’, for which you need to look for vertical blinds, roller blinds or faux wood venetians. 2. A home with kids and pets need to look for blinds which do not have dangling strings or rails. This is playing ‘safe’. 3. Finally, decide on the type of blind in accordance to the maintenance required. There are quite a few window blinds which need only professional cleaning. Most of the doubts are cleared, now all that you need to do is conduct a research and ‘click’ on the required blind for your home. Yellow is one color which is most often avoided by homeowners. 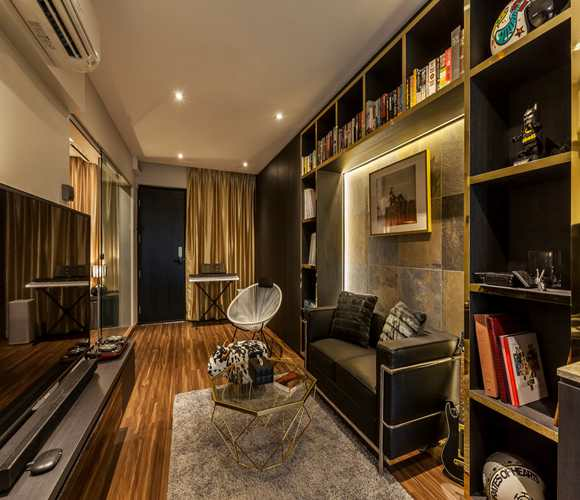 Definitely, this color poses a challenge where interior decoration is concerned but at the same time, you need to be aware that this can be a color of warmth and sunshine and reflects the same when used in the apt manner. This color tends to spread life in the interiors, offering happiness to the people around. You have a choice of different hues in this color, which means you are in total control. For that soothing feel and look, muted yellow works out an apt choice. For a room which is dull and drab you can opt for the yellow considered as ‘sun-kissed’. This brings in all the warmth you require for that specific room. The pale yellow ensures a feel of spaciousness in a compact room. Sunny Breakfast: A nook used for breakfast works out ideal for a quick sweep of the sunny yellow. You need to ensure that the accents used are more on the rustic side, like a table which is made of weathered wood or even a whole lot of pillows.Opting for a Combo: Most of the colors tend to gel well with the yellow color. For that apt combo in a room you can plan on baby blue, coral and golden yellow. Plan on few more strong elements to ensure the yellow tones stand out on walls which are pale. Coral speaks of boldness, while the baby blue offers a touch of gentleness.Elegancy with Yellow: Using this yellow color in constrained doses and on materials which are sumptuous is bringing out the elegancy of this color. Plan on paintings, silk pillows and chunk lamps for the elegancy and class you are looking for.Sunny and Sunny: Gray is one color which blends well with yellow. The tempers in cool gray offer a balanced palette. Though this combination is popular there is nothing ordinary about the look it offers. Wall paper in yellow teamed with a concrete sink in gray in the bathroom is definitely an ‘extra-ordinary’ look for your requirement. Ensure of wooden tones on the mirror, ceiling and the base of the sink to complete the look.Electric Yellow: Paired with black and white in graphics, neon yellow is outstanding. This is definitely electrifying. This can work wonders for any bedroom.Before using Yellow:Ensure you make use of this color in a manner which is relevant to the present times. *If you go for brighter hues of yellow, play it safe and use this for the different accents. Opt for a yellow chair against interiors which are monochromatic or probably as cushion covers against a sofa which is navy blue. *Using mustard or maize can make a space look brighter and can pump up a warm feeling. *Using this color in the kitchen definitely offers a sense of optimism. Opt for yellow doors and different furnishings to ensure that the brooding gray walls in the kitchen are over-shadowed. This color works well in the play room and the bedroom. *For a living room which is white or neutral, yellow works like a pop-up color. This ensures a touch of uniqueness to the room and can also lighten the total mood. Besides this, it adds a touch of warmth to the total interior. *For that rich look, mustard yellow works apt with navy blue. Add a few yellow accents in a navy blue study and mark the difference.To ensure you have the apt décor of the interiors, it is important to ensure you make the ‘right’ choice of the yellow shade. You have the choice between the bright and bold shades of yellow or probably the calm and serene shades. This totally depends what you are looking for.The best way to go about this is to get in touch with a qualified and well-reputed interior designer. For that little extra money spent you are assured of this color ‘yellow’ being used in the classy manner. You need to ensure that the total picture is taken into account before making a choice of a specific shade of this color, ‘yellow’. In short, if used in the right manner, this color can bring out the class and elegance of any ordinary interiors. Luxembourg Becomes First Country to Make All Public Transit Luxembourg is set to become the world's first country to make all of its public transportation free. The newly re-elected Prime Minister Xavier Bettel and the coalition government have announced that they will lift all fares on trains, trams and buses next summer. Taking aim at long commutes and the country’s carbon footprint, the new move hopes to alleviate some of the worst traffic congestion in the world. Landlocked by Belgium, Germany and France, Luxembourg has more than 400,000 commuters travelling in to work from neighboring countries. This year, Luxembourg started offering free transportation to everyone under the age of 20. Secondary school students have also been able to ride free shuttles between school and home. Luxembourg currently has the highest number of cars for its population in the European Union. As The Guardian reports, a decision has yet to be taken on what to do about first and second-class compartments on trains. Commuters now pay €2 for up to two hours of travel, which covers almost all trips in the small country. The governing coalition said it planned to overhaul tax breaks for commuters, a benefit that has been available based on the distance traveled. Beginning in 2020, all tickets will be abolished to save on the collection of fares and the policing of ticket purchases. We have to know that we have three primary colors: yellow, red and blue. Mixing primary colors with secondary ones we get different color shades which are called tertiary colors. Complementary colors are opposite each other in the graph. Yellow is a bright and fresh color that brings joy and energy into spaces and this makes it eye-catching. In order words, yellow is a great accent color if you want to highlight the most important elements in your interior design or to create focal points in a room. Yellow is a very eye catchy colour and it compliments well if paired with darker tones specially Black Using yellow colour gives a vibrant and optimistic appeal to the chosen space. Besides yellow can be mixed with several other colours to make different shades that can create any desired effect, subtle or a melodramatic ambience! Color psychology suggests that certain colors are capable of evoking certain moods and may even have an influence over behavior and well-being. Yellow can quickly grab attention, but on the other hand it can also be abrasive when overused. It can appear warm and bright, yet it can also lead to visual fatigue. So one has to choose carefully the different factors, including past experiences and cultural associations, because some colors do tend to evoke certain moods or feelings. This colour of sun and the flowers can be very challenging and intriguing for the Space Decorators Be it homes or Office Spaces And I call it the “Bold and Beautiful” representations! A kitchen has managed to gain importance with the passing of time. Homeowners have realized that a design of a kitchen can assist in the functionality factor and also add comfort to the total space. These days, with the kitchen design being planned out, you find the most homeowners are proud to take their guests in. As known, this is definitely a ‘high’ activity area of any home. Working, cooking, cleaning, which otherwise are considered as daunting tasks, are now carried out with comfort and ease. Some tips listed below can ensure you opt for that ‘perfect’ design for your kitchen. 1. Planning and more Planning: Planning on a kitchen design is time-consuming. This, at times, takes more time than the actual construction, but is totally worth the effort. Planning can also help you stay within the budget you have decided on. · The existing design of the kitchen needs to be taken into consideration. In case you have decided on a new refrigerator, make sure the doorway is broad enough. · The work aisles need to be at least 42 inches in width and those kitchens which have more than one cook, you need to ensure the aisle is minimum 48 inches in width. · Keep egomaniacs in mind when designing the kitchen. The base cabinets need to be drawers or probably, pull-out shelves. You can opt for counter-tops which can be adjusted in height and opt for a wall oven instead of the range. · Decide on the materials you require for the remodeling of your kitchen and do not overlook the fixtures. The contractors can price the design in accordance to your requirement. · Finally, it is advisable to opt for professional help from a well reputed interior designer. 2. Keeping the initial Footprint: To ensure the redesigning of a kitchen works well within your set budget, it is advisable not to change the location of the plumbing pipes and the outlets for electricity. Try not knocking down the walls unless it is absolutely important. 3. Sensible about Appliances: Redesigning a kitchen is definitely an exciting project. It is advisable to be wise about the appliances so that you do not waste your money. You have a wide range of choices available in kitchen appliances and these are definitely very tempting. You need to make sure these are required before you give into your temptation. The fridge, cooking range and other appliances need to be bought according to the number of family members living in a house. Though it is important to opt for a ‘classy’ kitchen design it is sensible to be careful in making a choice of the kitchen appliances. 4. The Power of Lighting: With multiple lighting fixtures available these days, the ‘classy’ look you are looking for in your kitchen is affordable and easy. Apt lighting fixtures can help in the brightness of a kitchen. · You have the choice of the lighting which is under-cabinet. This can be essential choice as cabinets can be dark places. · Ceiling fixtures track lights and wall sconces can be used for the overall lighting. You can opt for the dimmer switches for the right mood and ambience. 5. Adding Storage: You need to concentrate more on the storage factor. This leads to a ‘clutter-less’ kitchen which is neat and tidy. You can plan on cabinets which tend to reach the ceiling. The storage space offered with this arrangement is definitely valuable. 6. Surface and Space: Ensure you opt for a surface which can be easily maintained. This saves on time and energy. Stainless steel can easily scratch and tiles tend to accumulate grout. Redesigning a kitchen is important more so if you stay in an ancient home. This design can help not only in changing the looks of the kitchen but can also add to the safety and functionality. You need to ensure the appliances are arranged in a manner so that you can work with ease and comfort. As mentioned earlier, it is advisable to seek the help of a professional interior designer. These professionals understand your requirement to the tee and can create wonders in a fixed budget. All you need to do is make an effort and research for the designer. Opting for a specific type of flooring is one of the initial decisions to be made for a home. This is considered as canvas upon which the patterns, colors and the designs of the decorations and furniture are based. It is definitely helpful to have some knowledge of the different types of flooring which can add to the elegance and class of an interior of a home. 1. Wooden Flooring: The option of the wooden flooring is one of the most popular options offered. This flooring works well for most interior designs, be it the traditional, contemporary or even modern. The versatility of wooden flooring is indisputable. Besides this, you can also choose between the engineered wood and the solid wood. You can opt for maple, oak, cherry ash, mahogany or even walnut. This can be worked out in accordance to the set budget and also the preference. If you have the ‘unlimited’ budget you can look for mesquite, teak or Jarrah. This type of flooring requires a bit more maintenance as compared to other types as wood is prone to scratches. Ensure that this flooring is not used for rooms which have under floor heating. 2. Vinyl Flooring: Vinyl flooring is gaining the required popularity as this works out apt for areas of high traffic. You find a wide range of different looks available with this type of flooring, which include parquet, stone, tiles and wood. As this flooring is available in a wide range of textures, styles and thickness it tends to work well for all sorts of requirements. This flooring can be chosen by the families who have pets or even children. Maintenance is easy and thus works out a ‘healthy’ option. Vinyl flooring is resistant to water and is thus, used widely in kitchens and bathrooms. 3. Laminate Flooring: Laminate flooring is one option which can work out suitable even in your work place besides the home. This product is multi-layered and is synthetic which is fused using a specific technique. You have a choice of different finishes like smooth, textured or embossed. This only adds to the flexibility of this flooring. You can opt for a specific effect like the tiles, slate, wood or stone with either a gloss or a matte finish. Besides easy maintenance the laminate flooring can be easily installed. As laminate flooring tends to be a little slippery you need to plan on adding the layer for slip-resistant. 4. Marble Flooring: For the ‘extreme’ class opt for the marble flooring. This flooring is denser and harder as compared to the travertine or limestone flooring. Marble speaks of luxury as this offers a ‘unique’ look to any interiors. This flooring blends well with different types of décor as this is available in different colors. The marble flooring is considered as a ‘life-time’ investment as this lasts for almost a life time. You need to ensure you make the apt choice as there is no way you can plan on replacing this frequently. To add to the many positives of marble, this works out ‘easy’ maintenance’ and offers a ‘glamorous’ look. 5. Concrete Flooring: As concrete flooring is available in a wide range of colors and different finishes, this works out amazing. The only effort you need to make is ensure you get this polished. This flooring is treated with a specific chemical densifier after it has been diamond ground. After which, this is buffed using tools for polishing of diamonds. This offers a high gloss finish which speaks of style which can be used not only in the interiors but also in the exteriors. Before you decide on a specific type of flooring, you need to decide on a budget. You also need to consider the location of where you need the flooring for, as all types of flooring might not be apt for the exteriors. Choosing flooring which is friendly to the environment is equally important. Life style can make a huge difference to the choice of flooring. Get that ‘wow’ factor with an apt choice of flooring. There are multiple options available and getting the one which can meet your requirement is not a difficult task. Its concluded that office space and designs is directly effective to the productivity and wellness. Our productivity levels drop when we feel uncomfortable—whether it’s the temperature, the atmosphere, or the noise levels, we need to be relaxed and comfortable to work at our best. Mainly the office space would comprise of two main layouts the cubicles or the open plan and the closed cubicle is now become such a trend in the office designs it was to give a sense of independent, comfortable and personal working space to the employee. Now the offices do that to cramp up more people in smaller spaces and the other hand the open plan supports the logic saying it gives a satisfaction of working together and feel less isolated. It’s also potentially helpful for interns and less experienced members of the team to rub shoulders with those in more experienced roles. The flip side being the “lack of privacy” issue may annoy workers in open-plan environments simply because they feel they are being watched and cannot get away with unsolicited intervals. The second factor is the chosen colour! Different colour themes have different impacts and psychological effects. (Example - white has a v modern appeal). It’s a very clean and a sleek look; Pink would have a calming effect Brown refers to seriousness and practicality Blue is one of the most productive and right shade has a calming effect too However blue can also move swiftly towards the cold effect So one has to choose wisely depending on the workspace The business, the employees and the designs and directions The third factor is the lighting and the windows “The extent to which daylight exposure impacts office workers is remarkable,” Increased levels of natural light also encourage the appearance of office plants, which have been proven to lower workplace stress levels and increase productivity. And suppose you have a windowless space then there are several way to compensate through artificial lightings, you could also consider investing in reflective office furniture to help reflect light and create a light, airy feel. Having said all of that it’s very important to not get carried away and not only end up spending a fortune but also creating a comfortable and clutter free and trustworthy workspace for the onlookers, clients and the staff. A good office decor should last you for a number of years and at the same time send out the right message. So striking the right balance will definitely create positive results and increase in productivity and help achieve a goal and guaranteed satisfaction! Interior Networkers brings to you this week a closing chapter to its monsoon maintenance of house interiors. This week we drift towards a more energy related topic, to cleanse your house of any negative energy, as the water pours from the sky let us detox your home and bring in good fortune. To tap into the benefits of the monsoon season, here are a few Vastu Shastra tips to consider for your home interiors during the season. According to Vastu Shastra, you can keep the doors and windows facing the north-east open after the first few showers to allow positive energy to flow in. The natural flow of rainwater in this direction can bring good luck by altering negative vibrations. However, do not allow rainwater to enter through the south-east and south-west direction as there could be a strong energy clash considering the south-east direction is known to be governed by the element of fire. Therefore, waterproof parts of the house in this direction that are prone to leaks. Fixing leaks will prevent ill health to prevail in your home, as per Vastu.Placing a hanging basket with a four-leaf clover in front of the door or near the window will bring in good fortune.As part of making your house monsoon-ready, it would be best to have pest control done at your place, especially near the drains in the kitchen and bathrooms. Pests and termites are usually carriers of negative energy.If you have unattended wires at home, it would be advisable to get them fixed before the rains. if there’s a faulty wire in the house, do not neglect it. In addition to posing a health risk, exposed wires can also fuel negativity in a space, according to Vastu.According to Vastu, the burning of camphor can purify the air during monsoon. The strong fragrance of camphor is loaded with healing properties, thereby filling your home with positivity. Also, mopping the floor with boiled neem leaves will clear your space of negative energy.Vastu prescribes where plants can be placed to extract the maximum benefit from them. Planting lemongrass, which is known for its medical properties, near the window or in the garden will remove impurities from the home and its surrounding areas. Hope these tips help you set your interiors right this monsoon season! Stay with us for a brand new series next month! Often times we forget while designing our house that we live in the Augmented Age. That without our tech gadgets we are virtually as well as actually powerless, and with it we are limitless. So why is it that their place in our home is still struggling to exist? We have tables to put are laptops on, but no place to put the phones when they charge. All sockets are singular and are used for an array of activities. This month at Interior Networkers we are covering these little things that we miss when decide to renovate / decorate or even design our house. This week’s topic? Charging! Utility drawer We all have one of these drawers in the kitchen / study / bedroom and probably even the living room that are full of phone and laptop chargers – some call it the ‘dumping drawer’. And we can bet you’ve run out of power points in these rooms at some stage and have had to unplug your charging phone or tablet to plug in elsewhere. 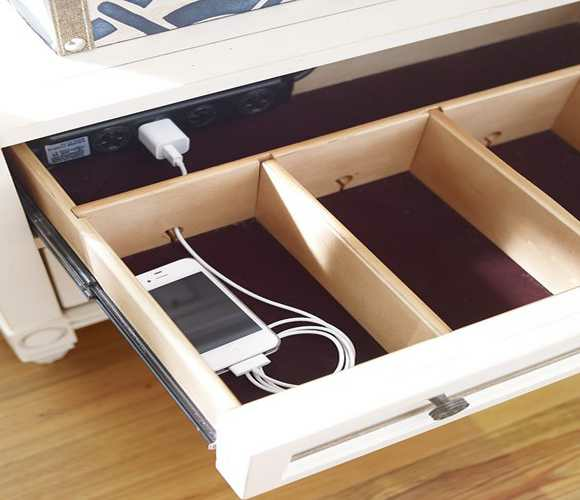 Free up a drawer in your room, by using that same ‘dumping drawer’ to actually charge your gadgets in. And its not just your drawer, you can build in your chargers points in your cupboard, overhead cabinets, and even inside your bed side table! The magic of these lie in the idea that your phones/ laptops are not out, when not in use and charging. Therefore very easily avoiding all dust, pollution and most importantly heat! Defined cupboard Now when we come to wifi routers, and cables of similar kinds: its difficult to put them in drawers since they need to have place for their longer wires and cables, if you mix these up with your phones and laptops there is again a chaos that ensues among them. So how can you put these away? A separate cabinet is always advisable, and little details in the cabinet that lets you coil the cables away and pin them inside properly. Table accessories And finally, when you’re a forever desk worm- you may need to keep chagrining your phone/ laptop all day round. A desktop accessory with a hidden spike guard is the way about it. It can be a pen holder or even a large memo pad with a clock on it! Anything smart will do the trick! Let us know your thoughts in the comments section below! Keep up with Interior Networkers to know about other Interior Tech Design ideas! The magnificent gateway that welcomes the Arabian Sea at the doorstop of Bombay. The Gateway of India. I am mesmerized by the grandiose structure. For me it is the confluence of the gateway and the Arabian Sea. Their love ever since it was built remains firm. The waves in the sea sometimes ferociously, sometimes gently kiss the Gateway. One can stand for hours to see this immortal affair. The elegant promenade have tourists throughout the year. The witness of this association the sun, the wind, the birds, the people, the hustle and whistle of the boats. The Gateway of India is an arch monument built during the 20th century. 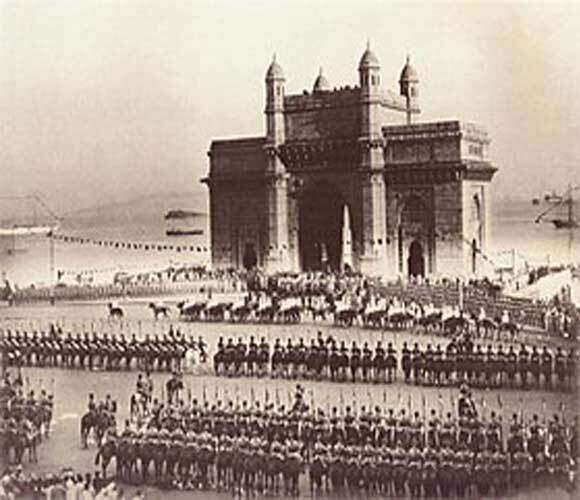 The monument was built to commemorate the shoring of King George V and Queen Mary at Apollo Bunder on their visit to India in 1911. The Gateway served as an entry and access to India. The Gateway was opened on 4th December 1924 by the Viceroy (to the public) that makes it 94 year old. For me the love for the place started ever since, I was a child. A very fond memory of my childhood relates totally. I visited the Gateway of India with my maternal grandmother, throughout the visit sitting in the car Naani was singing “Ye hai Bombay Meri jaan “. When you love something you tend to know more about it, hence my indulgence in the history of the place came naturally. The Architectural magnificence of the place really helped me understand it better. The monument design is a combination of Hindu and Muslim Architectural style with that of the English Gothic style. The Architectural style is called Indo-Saracenic and Roman Triumphal Arch Type. Notably George Wittet and John Begg were two men responsible for the evolution and subsequent popularity of the Indo – Saracenic style of Architecture style. Willet is also known to have designed few of Bombay’s monumental landmarks like The Prince of Whales museum, The Institute of Science. The Wadia Maternity Hospital, King Edward Memorial Hospital, the Grand Hotel. The Small Causes court at dhobitalao and the Bombay house which houses the Tata Sons. The Scottish Architect George Wittet was able to sanction his final design in 1914. The structure is made of Yellow Basalt and indissoluble concrete. The Central dome of the monument is about 48 feet (15 meters) in diameter, with a total height of 83 feet (25 meters). The intricate latticework gives the designs a marvelous look. Latticework is openwork framework consisting of a criss – crossed patterns of strips of building material, typically wood or metal. The design is created by crossing the strips to form a grid or weave. The Latticework is carved on stone in The Gate of India .The Prominent Feature of Gateway of India are the 4 turrets’. On each side of the arch, there are large halls with the capacity to hold 600 people. There are steps constructed behind the arch of the gateway that leads to the Arabian Sea. To summarize my appointment with the Gateway of India the song “Ae Dil Hai Jeena Mushkil Yahan….. Ye hai Bombay Meri Jaan”. Happy or challenging but you can’t live anywhere else once you have lived in the city of dream Bombay. Whether you’ve just moved or are looking for a quick, little home pick-me-up, or perhaps something more significant, there are some well-known interior design tricks that designers employ that you too can easily do with minimal effort and cost. Sometimes the smallest things make the greatest impact. It could be the addition of a mirror, a painting, a lamp or even a plant. Maybe you want to soften your walls, brighten a room, or add some warmth to your living space. Take a look at these clever design tips and see how they can inspire you!1. Paint smaller rooms in softer, lighter colours to help make the room feel larger.The living room above is a great example of how to maximize a small living space. A room of this size has the tendency to seem cramped, but the large windows, light coloured walls and ample use of mirrors not only reflect the natural light pouring in from the doors and the windows but the use of mirrors also gives the optical illusion of space, making the room seem larger than it actually is. Conversely, darker colours will make a room feel smaller. Even with the abundance of natural light and the strategic placement of the mirrors, this room in a darker shade would have a more boxed-in feel to it.2. Use decorative mirrors to add instant light to your living space.As seen above, mirrors can also be used to make a small space feel larger. For larger rooms, or any room with a more limited amount of natural light, mirrors placed directly across from the windows, will add instant light. Decorative mirrors can also be used in lieu of art to fill empty wall space. Large or small, mirrors add light and dimension to your living space.3. Mix it up. Mix up patterns and textures. Mix up old and new, expensive and inexpensive. There’s nothing wrong with placing family heirlooms alongside your modern couch. All good interior decorators will tell you that the most important aspect to decorating your home is that it reflects who you are, your personality and your style. The antique Chippendale desk that was your grandfather’s tells a story. It tells the story of your past. The modern couch you fell in love with and simply had to purchase also tells a story, your present story, and there is no reason why the present and past can’t co-exist beautifully together. The same can be said for art. Now you might not want to place a painting by Salvador Dali on the same wall next to a Monet, but there’s no reason why they can’t be in the same room together. With fabrics whether it be furniture, rugs or pillows, varied colors and patterns can bring warmth and texture into your living space.4. Slip into something a little more comfortable!Slip covers often get a bad rap but they are truly wonderful things. They can serve as a means of changing your furniture’s look to reflect the seasons. These easily removed coverings allow you to have a sophisticated look without constantly worrying about people dirtying or spilling on your furniture. Slip covers are ideal for rooms used frequently by children. 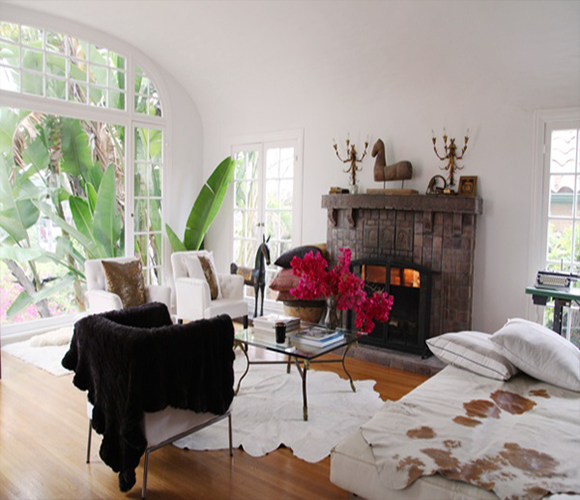 Above the white slip-covered couches gives the air of a casual, comfortable, easy yet sophisticated elegance.5. Wicker basketsWicker baskets are an economical and elegant way to add storage to any room. Baskets can be used to store and display books, architectural and decor magazines, toys, towels and blankets to name a few. Place a couple of small wicker baskets on the counter-tops in your kitchen to beautifully display and store your fruit and vegetables.6. Use what you already have to decorate.We all have items in our possession, probably packed up in boxes somewhere and haven’t given them a second glance. Your home needs some accessories. Instead of running to the store, take a good look at what you already have. Trays, wooden, acrylic, metal or silver can be placed on top of luggage racks, tea carts, trunks, bedside tables and coffee tables for extra texture and dimension. Arrange candles on them, frames or pile books on top of them. Plates can be hung to create wonderful wall art. Art from children’s books can be framed and hung in nurseries, children’s rooms or their bathrooms. You will be amazed at what you can do with what you already have!7. Add a hanging pot holder to your kitchen.Kitchens are meant to be warm and inviting. We spend much of our time in them whether it be for preparing meals, serving meals or entertaining. A hanging pot rack is useful elegance. Kitchens are meant to feel as though they are in constant use and a hanging pot rack certainly makes one feel this way. In addition to looking so wonderful, (there are many sizes and styles available) additional cupboard space below is now freed up to store other items. Seldom has anyone complained of having too much storage.8. Go green.Add plants to your living space. Add them to every room, small or large, few or many. Plants are an inexpensive means to accessorizing your space and adding color and texture. Not only are plants beautiful but many can clean household air and balance humidity. They can absorb pollutants and remove harmful gases from the air. No home should be without these wonderful greens!9. Paint or wallpaper your bookcases.This instant pop of color will brighten and re-energize any room! It’s amazing how something so simple as a coat of colorful paint can instantly energize and transform your space. This built-in bookcase would be simple and ordinary without the bright blue interior. Perhaps the simplest and most inexpensive way to transform a boring space is to apply a coat of paint somewhere unexpected. Bookcases are an ideal place to start because you don’t need to paint a large area. Other fun places to add a pop of color include painting fireplace mantels, the insides of closets, hallways and ceilings.10. Use area rugs to soften hardwood floors.Throw rugs give warmth and can add great texture, color and personality to your living space. Hardwood floors are beautiful and easy to maintain but they lack the comfort that carpeted floors offer, especially in the cooler months. Area rugs can add fun and functionality to your living space. Use several of varying patterns and fabrics together to showcase your character. Or add several rugs of the same pattern and fabric, or different textures but the same color. The possibilities are endless. You can change your area rugs to reflect the seasons using warmer tones and fabrics for cooler months and lighter ones for the warmer days of the year. There are many lovely cotton, washable area rugs which are ideal for those homes with children. There really is no reason why a home with young children cannot also be a stylish one. Interior Networkers strings together for your homes wallpaper décor that would bring in light and shun out darkness. Set the mood in the right style by papering up your space: DICTATES STYLE: While wall color encourages mood, designer wallpaper design does this and a bit more. Visually, it offers a direction towards a particular style. A damask print perfectly denotes a traditional bedroom just as a honeycomb one does for a contemporary dining room or an ikat one for a global style living room. ADDS DRAMA: Without having to invest in expensive art or lighting, designer wallpaper is a great way to enhance a room design with a bit of dramatic “wow!”. Whether a marbleized pattern with shimmering gold splashes or a whimsical forest motif, wallpaper can really wake up a space through color and art. COVERS DOORS CREATIVELY: Let’s not over-look doors as surfaces with covering potential. Get creative by using wallpaper on door panels for a varied look. And those outdated sliding mirrored closet doors? Cover them with removable adhesive wallpaper like this orbit small metallic one as a modern alternative. BRINGS IN NATURE: Adding an element of nature is not limited to placing a lovely fig leaf tree in the corner. Floral prints can evoke a colorful spring garden in the living room while a verdant fern pattern gives the home office a sense of calm. INVITES ACCENT WALLS: Accent walls play a key role in enhancing a room design. Offer another layer of color and pattern wallpaper on a prominent wall, a niche, or chimney wall for added interest. Textured wallpaper goes above and beyond with another design element added. Set your rooms apart with this new trend, leave behind the paint and bring forward the innovation in design with interior networkers:: paper up your walls this Thursday! Interiors today want to declutter to the maximum, especially if we look at homes: the purpose of building a home in a megacity in the twenty first century has become increasingly about saving space. People do not care for opulent furniture anymore, they do not want the most expensive fabric enveloping their sofa set. They want freedom to move around their home, and live a stress free life. Decluttering invariably equals to stress free living.Today, we’re covering homes: how can we store it smart at our homes?1. Shelves behind a sliding mirror panelStow away your bathroom clutter on shelves that are built behind a sliding mirror panel. You can check yourself out and keep the bathroom clutter in check at the same time. 2. PegboardGoing for the industrial style? Interior Networkers totally recommend using a large pegboard as storage. It’s a great choice for the kitchen, because of how versatile and stylish it is. You can hook up your wares and utensils to make it easier to reach for them when you’re doing your cooking. Install shelves on the pegboard to use as a display stand for your dishes or décor.3. Platform storagePlatform storage is great for smaller spaces as it takes full advantage of the square footage. It’s a good choice for storing things that are not frequently accessed, such as bed sheets, winter clothing or extra cushions. The raised height is also great for defining a space, and if placed next to a window, also helps to maximise the outside view too!4. Cubbies surrounding your sofaInterior Networkers loves them particularly for books and display items. Surround your sofa with them to make the most out of a popular “dead space” and create a little cozy enclave in your living room. This cubby design is brushed with gold accents to elevate the look from ordinary to fabulous.5. A TV feature wall that doubles as storageA full-height, wall-to-wall TV feature wall also doubles as a storage for media units, books and other bric-a-bracs. The pops of blue, against the matte black, is a stark visual contrast, while providing a uniformity with the hues in this home.6. Storage under the stairs: When addressing a duplexIf you’re lucky enough to get stairs in your home, make sure you make full use of it by incorporating storage underneath. The steps serve as natural dividers, so they help to keep your things organized.7. Bay window storageBay windows are great for creating this cozy reading nook. But if you aren’t much of a lounger or if you have very limited floor space, it might be more bane than boon. Incorporating an extra drawer above the seat of your bay window helps to make full use of this space.8. Indented shelvesIf you want things to look neat at home, recessed shelves are the way to go. They don’t take up as much visual bulk, but they can store plenty. Go for a glass front to turn indented storage space into an indented display cabinet.Stay connected with Interior Networkers, every Thursday for a smart interior design tip! The shower curtain is a problem place every monsoon season, with the moisture that sticks to its body and is so difficult to remove. Today Interior Networkers plans to deal with just that! Tips to clean out those curtains! Banish Buildup People swear by the incredible soap scum-slaying ability of distilled vinegar (heated first) mixed with grease-cutting dish detergent such as Dawn, in equal proportions. If your shower is made of stone, however, the vinegar could damage it. Instead, mix some liquid soap with baking soda until it's the consistency of frosting. Scrub it onto the glass shower door with a non-scratch sponge. 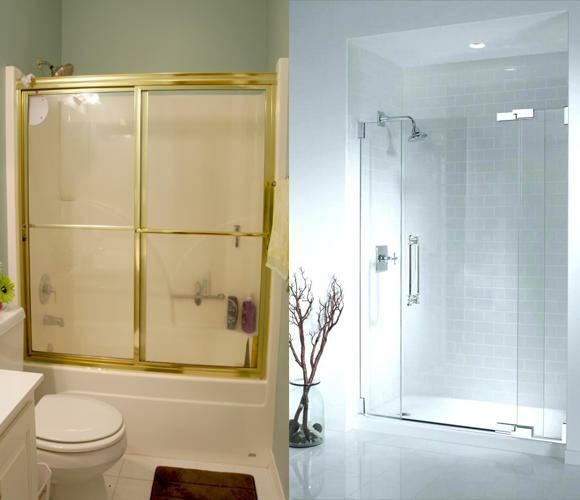 Multitask Clean the shower door as you're finishing up your shower. The warm water has already loosed up the grime, plus you don't have to worry about getting messy or wet. Use a sponge or foam cleaning pad such as a Magic Eraser, and you won't need to mess around with additional cleaning products or chemicals. Multiuse Tools Use a toothbrush for scrubbing the metal frame around your shower door. A paint scraper can help get the gunk where the metal meets the shower or door, and a razor, carefully and gently applied, can scrape mineral spots off flat glass. Squeegee, Squeegee, Squeegee Prevention is key. "The best thing you can do is squeegee the door after each use," Koenig says. Keep one hanging in your shower to make it easy. "It'll help keep hard-water deposits from building up, so you won't have to scrub so much later," she says. DIY Daily Shower Spray Using a shower spray daily builds time between deep cleans. Make your own on the cheap -- and without harsh chemicals -- by mixing 1 cup water, 1/2 cup vinegar, a little dish soap, and 10-20 drops of your favourite essential oil. Keep it in the shower, and spray the glass door down after squeegeeing. (Skip the vinegar if you have a stone-tile shower.) Stay with Interior Networkers for interesting Interior tips ! How to Decorate a Small BedroomTo turn your snug bedroom into a dreamy retreat, use these sophisticated small bedroom ideas and decorating techniques and clever storage.Here are some tips that will help you to decorate a small bedroom. Create a Focal PointEvery room needs a focal point, an eye-catching spot that establishes a hierarchy so you don't see just a jumble. Many times, the focal point is the head of the bed, which you can amplify with an arrangement of bold pillows. When organizing small spaces, your eye might also be attracted to the window. Rather than let these two strong elements compete for attention, place the bed in front of the window to meld cohesively. Or, dress one element—the bed or the window—neutrally, so it recedes and the other can take center stage. Keep Things OpenIt might be tempting to buy the biggest bed possible to feather a luxurious nest. But doing this in a small space tends to cause a more cramped feel. Instead, choose a bed with small stature that won't choke the room, such as an iron bed with a see-through headboard and footboard . Or pick a bed without footboard at all, such as a platform or storage bed . Doing so will keep the middle of your room open, making it feel larger.Be BoldThere are two ways to organize a small bedroom: You can make it dark and cozy with saturated berry reds or chocolate browns. Or, you can boost daylight with barely dressed windows and a light-bouncing color on the wall, such as cloud white or sunshine yellow. Either way, don't take a weak approach. You can be bold in a small space without risking too much money or effort.Sneak In StorageWhen decorating small bedrooms, every square inch is potential storage. Sure, you can stash sweater boxes under the bed, but if you boost the bed frame on blocks and add a voluminous skirt, you can hide a set of luggage under there. Place a storage ottoman under the window to hold extra bedding. Use a chest as a bedside table to gain drawer space. When it comes to organizing a small bedroom, make the most of your closet with an organizer system. And look for wall space where you can hang a bookshelf. 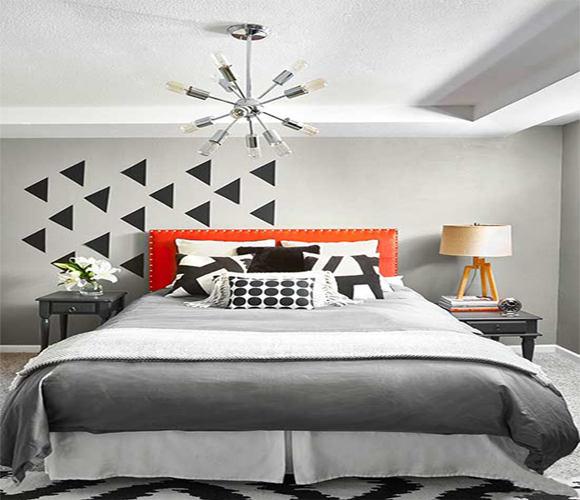 Use punchy fabrics and expressive patternsLook for ways to make your small bedroom special. Decorate a bedroom with punchy fabrics and expressive patterns. Choose interesting lighting, such as a charming chandelier or sculptural table lamps . For a small bedroom idea that makes a statement, try an unusual headboard: Pick one that is extra tall, brightly upholstered, or curvy. And use artwork to show off your personality. It doesn't have to be pricey -- framed snapshots will do. Remember, this is the most personal space in your home, so decorate a bedroom with what makes you happy. Embrace natural lightYou may want to rethink your black-out window treatments . Embrace natural light, which will help a small bedroom feel light and airy. Layer drapes and light-blocking shades for style and optimal light control. Think TallHere's a small bedroom idea with staying power: Hang window treatments closer to the ceiling to make a room feel taller. Don't believe us? Have a partner hold up curtains to give it a try. It's amazing to see the instant change such a small fix can make. Bedside MannersBe smart about storage when decorating a small bedroom. Employ a nightstand with drawers and shelves and install a floating shelf above for extra storage in a small bedroom. Consider room organizers for small rooms for maximum clutter control. Soft EdgesWhen decorating a small bedroom, go for furniture with rounded edges. It will take up less floor space and help widen walkways. Half-circle nightstands and rounded ottomans with hidden storage compartments are the perfect small bedroom accessory. Layers of StyleYou may need to defy convention when it comes to design ideas for small bedrooms. Specifically, get creative with the furniture layout! In this room, the bed slightly overlaps the two windows, but the placement provides ample walkways. Just be sure to move furniture several inches away from the window to make room for blinds and curtains. Use the Cube solver program to calculate the solution for your unsolved Rubik's Cube. Modern Luxury Bedroom Guide Bedrooms are more than relaxing home areas- they are our sanctuaries, and the place where are spending as much as one third of our entire lives. This is why luxury bedrooms interior design makes sense for all of us, regardless of our interests and possibilities. It is at the same time why all styles and design schemes pay the most attention to luxurious bedrooms ideas. We prepared a modern luxury bedroom guide to help you give yours a face lift, be that the master relaxing hub or your child’s sleeping area. Our functional and effective tips cover all aspects from bedroom design, starting with the walls and setting arrangements, and moving all the way to choosing proper luxury bedrooms furniture.The Fashionista’s Bedroom If it sounds like you, wait no more: Prepare the bedroom for a walk in wardrobe, or consider a vintage boutique in case space doesn’t allow fancy experiments. Bedrooms are also made for clothing and beautifying, so consider this their main function alongside sleeping and resting. The bedroom must be arranged in a way that accommodates all of your belongings, so think of ideas that would maximize storage estate, mirrors, and inspirational murals. A cool and modern idea is to use open rails for your clothes, so that your attire and valuable collections would be visible to everyone. An antique vibe with cabinet perfumeries and oval mirrors will also do, and so will everything you perceive as stylish. The super-modern bedroom Modern is often associated with creative, and you will easily recognize such a person looking to change the design display settings and add something personal to them. A good example of simple and prone-to-change design is the Swedish one, based on the idea of making space as functional and simple as life should be. Swedish bedrooms are distinguishable by simple color blocks and straight-cut lines and of course the lack of clutter that you can’t miss looking at them. Swedish designers also prefer high-gloss finishes, striking contrasts, and creative storage arrangements, and these are all great suggestions for those looking to create an up-to-date bedroom. The romantic bedroom Bedrooms have other functions except of sleeping, and for some of you, these may be the most important to consider for a great makeover. Whatever you intend to use the bedroom for, don’t hesitate to make it charming and luxurious, but make sure you preserve its calmness and are still able to rest there. Your bedroom can be anything you want it to be dash; a cozy boudoir, a comfort castle, or even a passion palace. This will depend mostly on the colors you using, as well as rich textures and luxurious fabrics including satin and the essential velvet. Bedrooms like these also deserve scented candles around, heavy curtains on the windows, ornamented accessories, and remote light you can adjust to the situation. 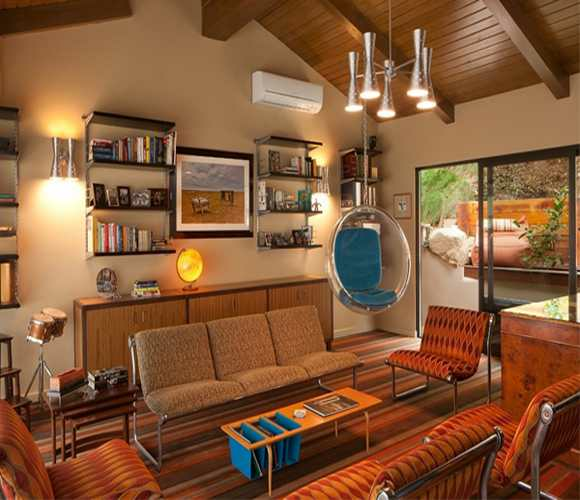 For some extra and inexpensive coziness, fill the space up with cushions and sentimental memorabilia. The minimalist bedroom Bedrooms are the zones at our homes where order matters the most, but unless we bring arrangements to the bare minimum, there will always be work to do. This is why some people take things in their hands, and ensure there are few elements in their bedroom that would make them feel discomforted or concerned. Their bedrooms are called minimalist bedrooms, and are recognizable by calm and neutral tones, hidden storage solutions, and a really carefully chosen modest furniture set. The bold and vivid bedroom For some of us, relaxation is something different than sleeping. Think of people with creative types of escapism, such as painting, or dancing to their favorite song, and you will easily guess what your bedroom needs. Bedrooms are cut to respond to such expectations, even if this means painting them with bold orange and audacious green, or bringing in some textures that make you feel energized and alive. The choice is up to you. The readers bedroom Readers tend to feel even more attached to their bedrooms, and consider those to be private haven where no one other than their partner should ever have access. This is where they read a good book or listen to a good song, and do the impossible to make the place cozier and more relaxing. Often, they use bedrooms as private libraries, where they arrange book collections in creative ways to turn this affection into a piece of visual delight. The sleepers bedroom At the end of the day, that’s what bedrooms serve for sleeping! Nowadays, most of us are too busy to enjoy the comfort, and would appreciate a place comfortable enough to shut their eyes and fall asleep immediately. In a scenario like this, go for natural and warm tones that please the eyes, and make sure you will get just as much sunlight as it would be pleasant early in the morning. Choose simple furniture pieces and soft them up with cushions, and replace traditional lighting fixtures with dim and remote ones. Ending thoughts Your age, style, or cleaning habits won’t determine how your bedroom should look when it comes to your personal relaxing haven, you are free to introduce all changes and details you believe could make you love it more. At the end of the day, the bedroom is the only place you won’t ever have to share with visitors, so make sure it suits you and not some of the fancy design suggestions you discover around. 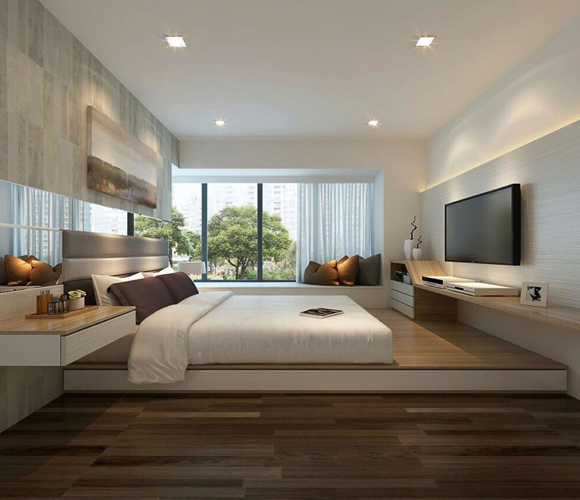 Are you looking to remodel your bedroom professionally? If you are, do you find it difficult to find what pleases you or your partner aesthetically? Then feel free to grab your partner and explore our site. We have dozens of luxuriously decorated bedrooms. There are more than enough modern bedroom design ideas throughout our website with a variety of modern bedroom furniture implemented into each design. There are hundreds of ways to design your own luxury modern bedroom. The concept can be quite daunting and intimidating, but our professional, luxury designs will help you tremendously. You will see a huge array of different luxurious bedroom furniture including beds, blankets, stands, end tables, curtains, other draperies, floors, as well as countless color schemes. Use the online Div Table styler for creating grid layout on websites because the traditional HTML tables are outdated and not responsive.